With the completion of the other seven Bloodthirsters in the Apocalypse formation, it's time to start work on the big Forge World guy. Once I get some pics of the other seven, I'll post them like I've done with my Space Hulk terminators. I had to work on the floor with this guy. I was on a roll and fortunately, my Wife loves me enough that she doesn't mind if I ruin my little carpet square I have in my work area. 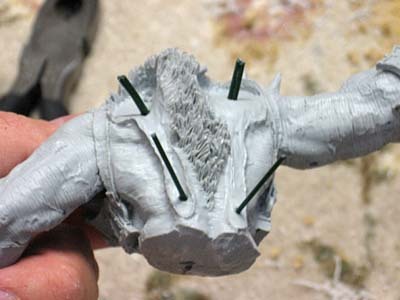 All in all, he went together fairly easy, He's got lots of little spikey bits that are a pain, but that's how they cast him so there's no getting around it really. The biggest challenge with this guy is transporting him. He's about the size of a basketball when assembled. That's huge for 40k and he would pretty much need his own carrying case which would be a giant pain in the backside. At first I thought about magnetizing the wings to make him manageable but after looking at the joints and seeing the sheer size of each wing, I elected to go with pinning them. Instead of using just one pin at each joint, I went with two smaller pins together for the wings and hands. The wings actually have three pins in each wing. There is a pair at the top and a single one at the bottom. It took this much to get the stability I wanted for gameplay. Pinning like this allows me to remove them for transporting and this guy breaks down into a few manageable pieces instead of one monstrosity. The trade off for being able to disassemble him for transport is that you can almost see gaps between his wings and body if you get up close and look really hard. A small price to pay I figure for being able to transport him without fear of damaging him. And here he is primed and drying. I still need to assemble the whip but other than that, he's ready for paint. 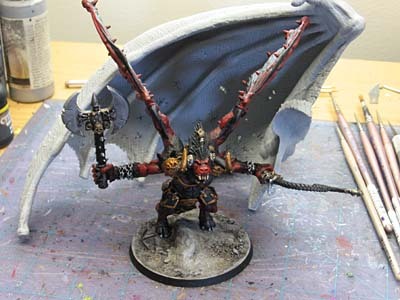 And yes, that is one of the regular-sized Bloodthirsters (on a 60mm base) under his wing. I'm planning on painting him up this coming weekend. "I'm planning on painting him up this coming weekend." Anyway, I know he's going to end up looking fantastic, and I can't wait to see him completed. And with the rest of the Bloodbath, I'm sure it's going to be insane... The sheer amount of damage that formation can put out is phenomenal. I just got back my circa 1993 Bloodthirster ... fancy an arm wrestle? And this my Daddy ... this is mummy and this is Baby Bloodthirster! I figure he's two solid days of painting. If all goes well, I'll have him done by Sunday. Next week, I may get to use him in a game. And the whole formation comes in in at just under 3000 points without any upgrades. 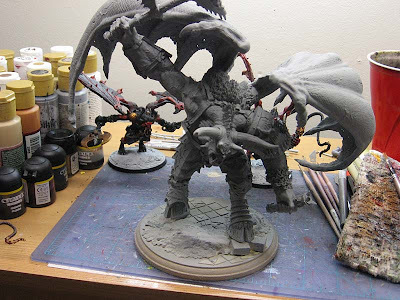 Wow, I've looked at that model on FW's site but didn't realize how huge he is! I am also impressed that you could paint something that big in only a few days, I look forward to seeing the finished work. Wow, that's big. I'm sure you're looking forward to the painting challenge on him too! Very impressive! I'd be intimidated by a model that size from a painting perspective. I find that the larger the model, the more difficult it becomes to highlight and shade without looking cartoony. Nevertheless, I'm sure that in your capable hands it will turn out fantastic - can't wait to see the final result! 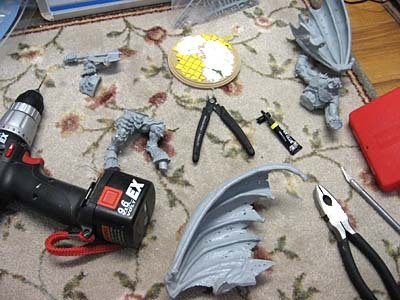 That is one impressive model,like most of the other FW sculpts. Now I wouldn't mind deep striking that onto the table, the sheer presence of it could force your opponent to throw the game. Look forward to seeing the whole force in one photo. Holy cow, he's huge! Are you expecting any issues with the larger than standard base? bloody hell he's massive compared to the normal one, and thats not a small model! That's no moon, that's a space station. Master Darksol: Not right now, it's just going to take a little more work duw to it's size. I'll have more room for details and such. I also had not realized that it was so big. Super Greater Daemon is more like it. But it is like 200 dollars compared to the normal one so it should be bigger. ok you are all nuts...a weekend? two days? a week? but cant wait to see how it comes out! wow, ive seen the scale pice on the FW site but i didnt realize how massive that thing is.